Looking ahead to a post-war building boom, the editor of Arts & Architecture magazine began an innovative program to create eight houses by eight nationally known architects—including Richard Neutra, Eero Saarinen, and Charles Eames—each to address a specific living problem. Without the restrictions of war, designs were to be focused on new materials and construction techniques for these “contemporary dwelling units”. 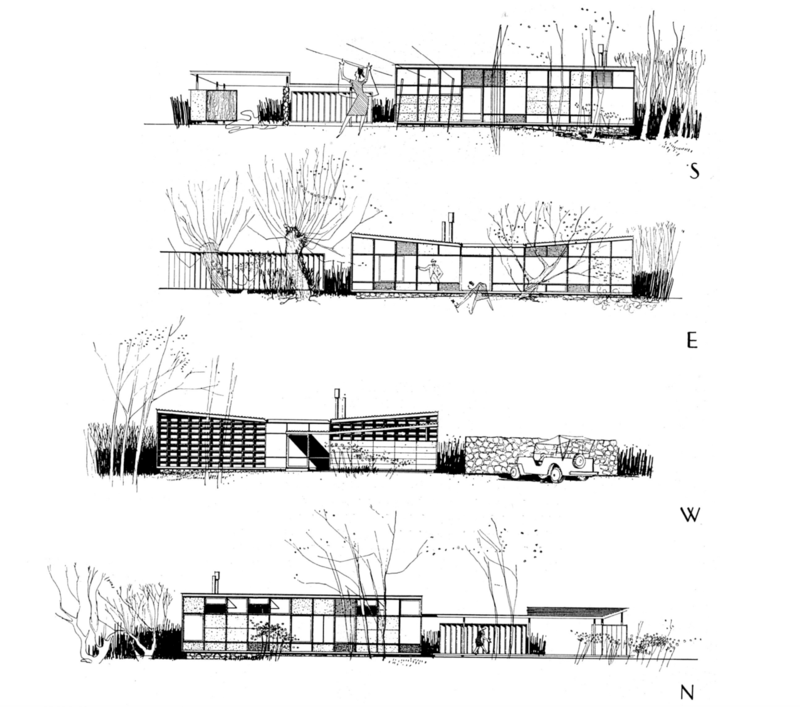 Though not all houses were built, the program spanned from 1945-1966, and included 36 designs located mainly in the Southern California area. With the intent to be accessible for the average family, the houses were designated a budget (subject to price fluctuation) and had to be easily duplicated. 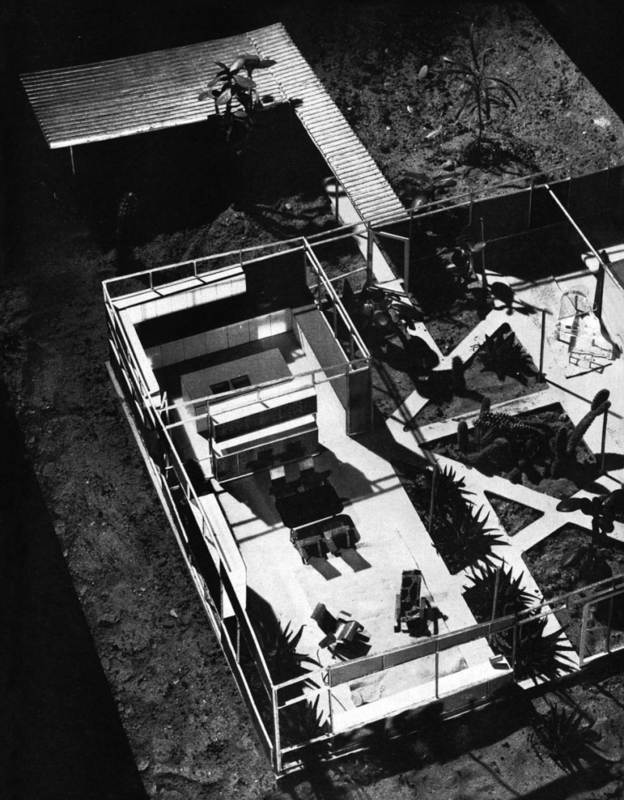 Introduced in the August 1945 issue, the challenge of Case Study House #4 was not to connect outward with nature, but to create an internal environment within the home’s four walls. The “Greenbelt” house—named for the grand central atrium—was designed for a city lot by architect Ralph Rapson, only 31 years old at the time. The large, glassed-in atrium area brought nature into the home while separating the food and living areas from the sleeping and relaxation rooms. “By creating a large inside grassed and planting area, the artificial barrier between man and nature is dissolved,” the original article states. The design was to be fluid with the owner’s needs, perhaps used as a planting or vegetable garden for some, while others might use the space for a croquet court or a small swimming pool. As we’ve seen in previous Case Study houses, the kitchen (or “food center” as they call it) is systematically combined with the utility and located close to the carport and front entrance. Sleeping and play areas open directly to the atrium, utilizing folding doors and partitions for privacy. 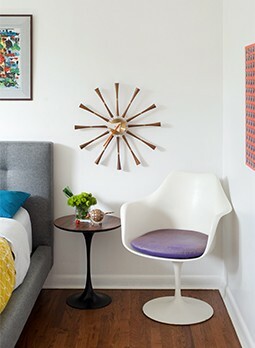 While we saw many built-in features in Case Study Houses 1 and 2, the Greenbelt’s interior design focused on personalization with only minimal furniture in essential areas. “All furniture and storage units will be kept light and mobile with as little as possible ‘built in,’” says Arts & Architecture. Rapson—who concentrated on affordability and prefabrication before and after this project—planned the home to be built from a flexible prefabrication model, utilizing materials easily available at the time of construction. The exterior was fashioned as a grid, allowing for interchangeable panels of glass or solid elements to meet the owner’s individual needs and/or budget. “The panels may be fixed or moving and may be solid, opaque, or clear glass,” states the article. Insulated metal deck panels were used for the roof, while either wood or steel made up the simple beam and column structure. To provide cost flexibility, several heating options were discussed including radiant floor panel heating, hot water circulation through pipes, or hot air via clay tile ducts. Unable to find the necessary funds at the time, it took decades for Rapson’s vision to become a reality. 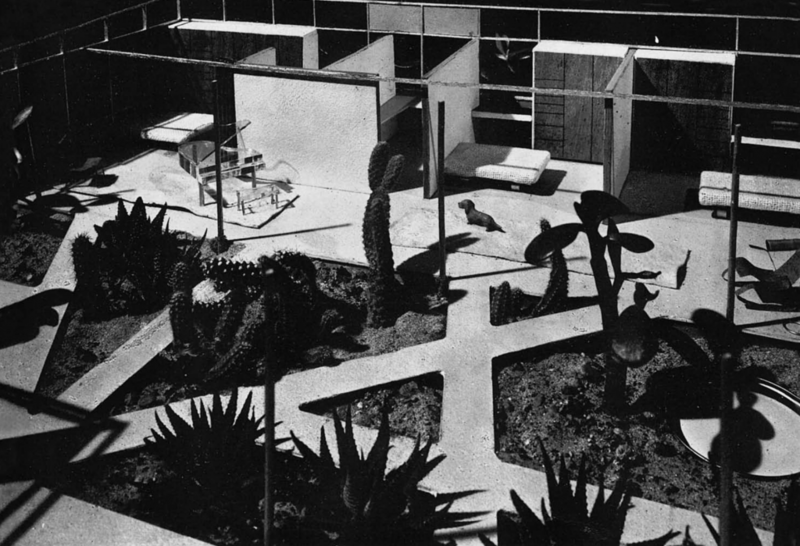 The Greenbelt was finally built for an exhibition celebrating the Case Study House legacy at the Los Angeles Museum of Contemporary Art, where it was on display from 1989 through 1990. Learning of a prefabricated home competition in a 2003 Dwell magazine, Rapson contacted the editor and, along with 15 other noted architects, was invited to submit. Rapson still found the 1954 design relevant and presented it with a few modifications. Although the Greenbelt didn’t win, Nathan Wieler, the developer behind the competition, tapped Rapson to construct the house design in 2004. Still available today through Weiler, home buyers in the United States can choose between seven different versions of the Greenbelt! To learn more, click here.